SKU: INLFF-1ST1. Categories: Accessories, Featured, Toilet Tank Filler Valves (FillerSaver). 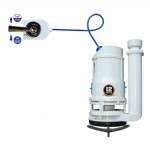 Eliminate the single most common cause of premature toilet tank component wear with this simple filter. Unfiltered water lines allow small sediment particles to enter through the tank filler valve, eroding the valve seals and then settling in the tank. These particles are very abrasive and once in tank, swirl around during flushes and further erode the various tank seals and flush valve components. This erosion effect shortens their service life and leads to annoying leaks at the tank bolts or seeping at the flush flapper. The problem is most common in homes with well water, but can also occur in city water lines where older plumbing is not sealed well. If you see sediment particles collecting in the bottom of your tank, then this screen filter is the solution. 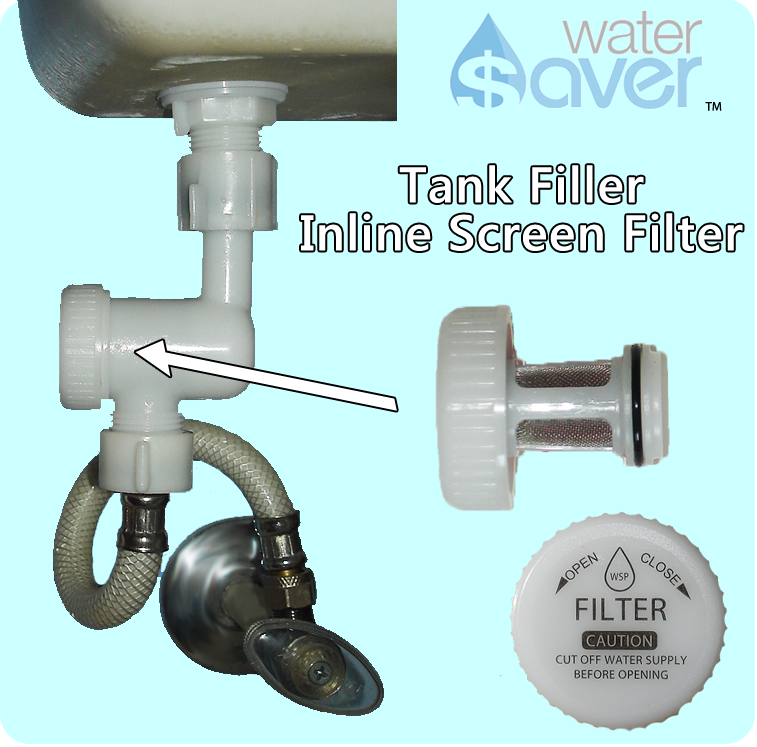 Installs quickly and easily by hand in most cases – simply turn off the water, unscrew the existing water line, install the InLine Screen Filter and then reattach the water line onto it. 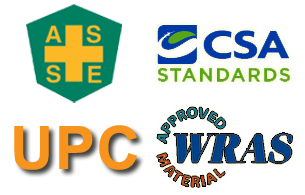 In some cases, a standard adjustable wrench or slip lock pliers are required to remove the water line. 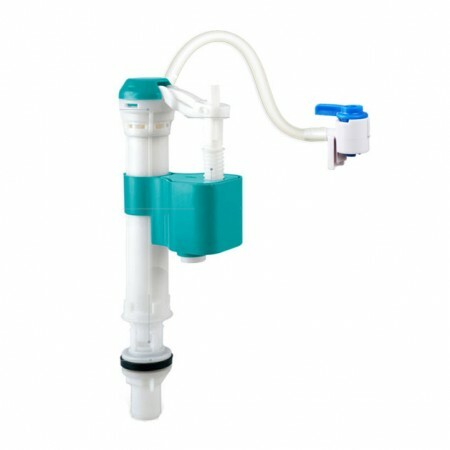 Cleaning is quick and easy by simply twisting off the filter cap, flushing out the debris and replacing the filter cap. 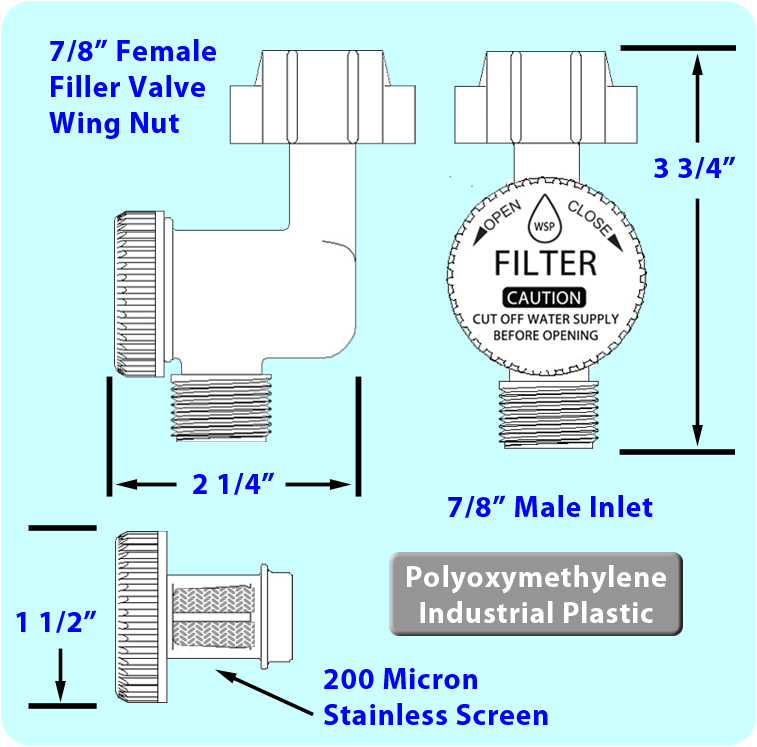 Standard 7/8″ “ballcock” threads (common to most US toilet filler valves) male-to-female inline with 1 filler-side seal washer. 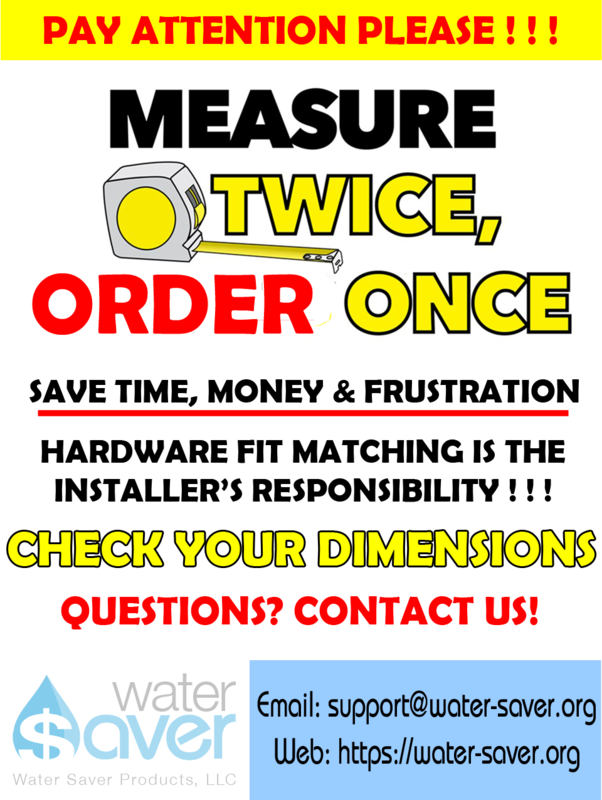 PLEASE CHECK YOUR FITTING SIZING PRIOR TO ORDERING. 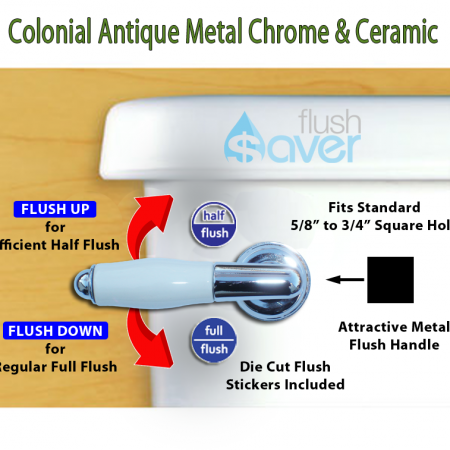 If your toilet “runs” because you have grit or other debris fouling the valve mechanism of your toilet, this is the answer. 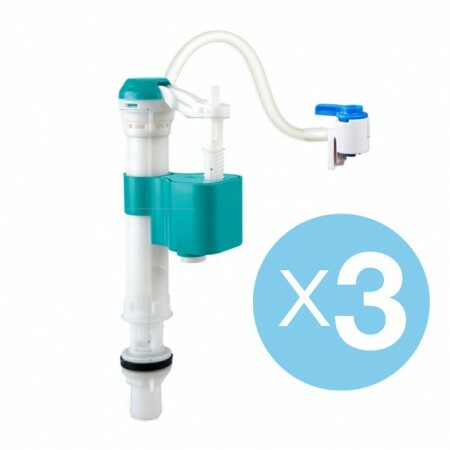 I have unfiltered well water going to my toilets, and since installing one of these at each toilet, I no longer have to keep cleaning the fill valve inside the tank. 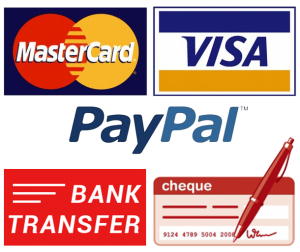 Inexpensive and super easy to install. These attached without causing me grief. The install is simple. Now I will no longer have to take my fill vavle apart every few months to clean out the little rocks we have in our water supply. My guess is that this filter will go for about a year before I need to empty it out. That should take, at the most, 5 minutes. I like is so much I bought 2 more. This was the answer to my prayers! For the first time in 17 years, after heavy rains for weeks, we had a LOT of debris in our unfiltered well water. I was replacing toilet “innards” literally every few days as they were too loaded to clean. I also was cleaning aerators every few days. 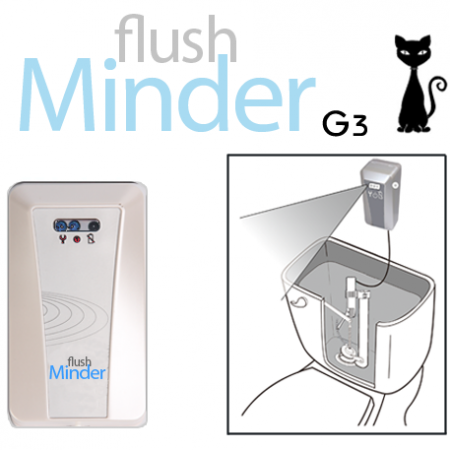 These solved the toilet fill issues and are FANTASTIC! 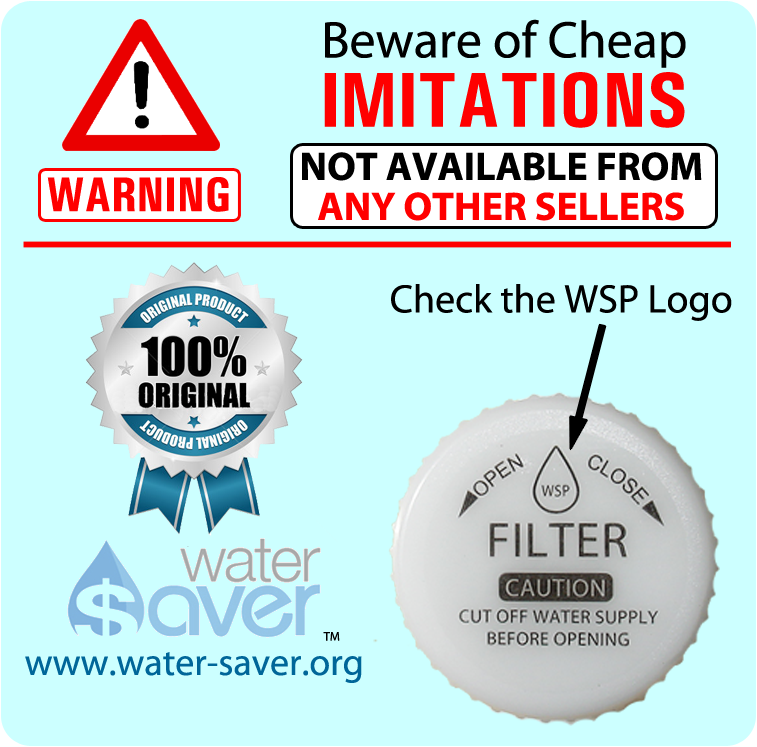 I highly recommend, and the Water-Savor service is second to none!